The Economic Policy Institute is out today with a new paper authored by Jeffrey Keefe examining compensation for public school teachers in Pennsylvania. If you are still an avid reader of letters to the editor in your local paper, or perhaps a braver reader of the comment section of the online edition of your local paper, you will not infrequently encounter angry comments about teacher pay being high. Those comments are typically based on bad data or incorrect assumptions. 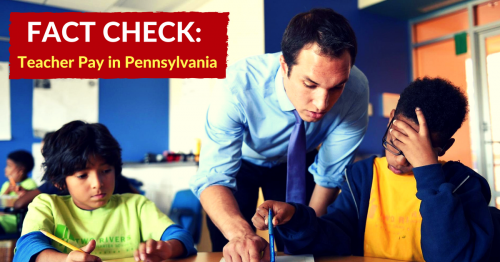 The Keefe paper carefully compares the wages and benefits of Pennsylvania public school teachers with other full-time workers who have similar characteristics – critically, similar skills and education – and finds that total compensation (wages plus benefits) are 6.8% lower for public school teachers than comparable workers. More troubling, Keefe finds that recently enacted pension changes for new teachers in Pennsylvania (Act 5) will increase the compensation penalty to 10%. A growing pay penalty for choosing a career in teaching comes at a particularly bad time, as the number of students graduating from teacher training programs has fallen in recent years by 63%. The wave of teacher layoffs, and school districts choosing not to replace new teachers that followed the deep budget cuts in the first budget of Tom Corbett, seem to have convinced many potential teachers that a career in teaching is not a good option. Now, districts in Pennsylvania seeking to hire great teachers are having difficulty finding qualified candidates. Falling total compensation for teachers is only going to make the teacher recruitment problem more severe.